It's hard to believe that this year marks the 24th anniversary of the death of John Candy. What isn't hard to believe is that Hollywood hasn't come near to replacing him in that time and comedy productions have suffered at some level ever since. With the greatest respect to today's modern frat pack of comedic actors but it is highly unlikely that any of that troupe will be remembered as fondly as the great Canadian. So what was it that Candy had that still has his films stoke such warm feelings of humour and nostalgia years later? Firstly, he had presence and charisma. 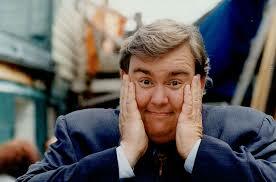 Great comedy actors can evoke a smile without even saying a word and John Candy was one of those actors. He was both a master of the slapstick and the smart jibe - a lethal yet necessary combination for comedy. He also knew his strengths and stuck to them. He was a funnyman first and foremost and unlike a lot of comedy actors that followed (Jim Carrey, Ben Stiller etc) he never attempted to diversify always aware where his real strengths lay. He also stayed true to himself never changing his physical appearance or comprising on his values or talents and always stayed true to himself. John Candy had magnetic on screen chemistry with all he shared the screen with, from the inexperienced (MacCauley Culkin - a full year before Home Alone, in Uncle Buck) to the comedy greats (Dan Ackroyd, Bill Murray, Steve Martin etc) and it was obvious in the end results what he brought to any feature he starred in. Off screen he gained a reputation as genuinely nice man with everyone in the business having their own tale of his warmth, humour lack of ego and overall likability. His tremendous portfolio of work is unlikely to be paralleled by any comedy actor working today and he was a staple diet of a lot of movie fans early movie memories. To give an indication of how talented he actually was I have selected 5 roles of the many many great ones he has played over his career to demonstrate how good he was and in an era of more miss than hit when it comes to comedy films, how much he is still missed today. 5: Cool Runnings - One of Candy’s last films sees the larger-than-life actor coach the Jamaican bobsleigh team in this true story about defying the odds. 4: Brewsters Millions - John Candy stars alongside Richard Pryor in this comedy about having too much money and not knowing how to spend it. A classic! 3: The Great Outdoors - Another co-starring role, this time alongside Dan Aykroyd, sees the two spend some quality time together with their families on holiday. Of course, nothing goes to plan. 2: Uncle Buck - John Candy gets one of his best roles as the over-eager Uncle Buck who is tasked with looking after his sister’s children after mum and dad are called out of town following a family emergency. Candy is in top form in this hilarious comedy. 1: Planes, Trains & Automobiles: - Without doubt John Candy’s best film is also one of the best films in the careers of his co-star Steve Martin and writer-director John Hughes. This road-trip-buddy-movie is a superb mixture of fish-out-of-water comedy and bittersweet drama built on the emerging friendship of an ad exec and a self-employed shower curtain ring salesman.